Barcelona, 9th of May 2013 – The logistic exhibition LOGISMED has been a great success for the engineering company TOP MANAGEMENT. As a consequence of the advertisements made in the newspapers regarding the alliance between TOP MANAGEMENT group and DLM (Delattre Levivier Maroc) group to create TMM (Top Management Maroc), several articles have been written in the Moroccan newspapers. TOP MANAGEMENT’s stand was visited by Mr. RABBAH Minister of Transport and Equipments of Morocco who was accompanied by the Infrastructures Minister of Senegal Mr. Alassane and the President of CGEM Mrs. BENSALAH. 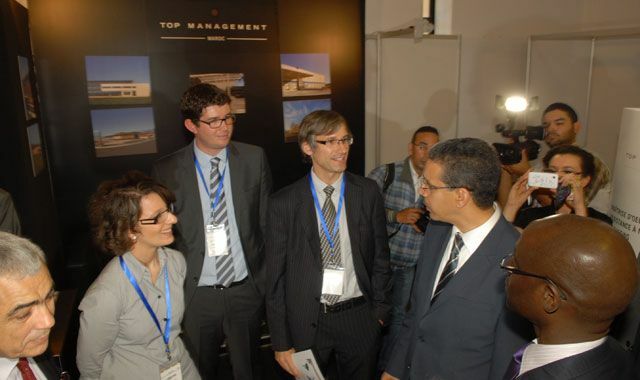 This visit provided the opportunity to inform the Minister about the creation of TMM in partnership with DLM group. Article in L’actu (written press). Article in Les Éco (written press). Article in Challenge no. 423 (written press).